In the NFL, the Miami Dolphins haven’t exactly gotten off to the best start. And this past weekend didn’t help anything, as not only did they suffer an embarrassing loss to the San Diego Chargers, but they also lost their starting quarterback, Chad Pennington, for the season. Not that Pennington was a big prize, but he did seem to the prove a lynch pin that made last year’s offense in Miami finally work. Well, their back-up QB situation isn’t too exciting in Miami. They’re staffed with Chad Henne and Pat White, two nondescript guys, and it looks like it might be a quarterback by committee start every week, which is no way to earn a playoff spot. 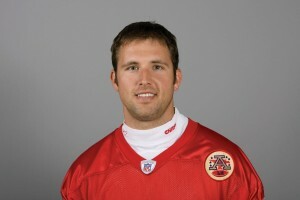 However, yesterday they made an acquisition: Kansas City’s Tyler Thigpen. You may not have heard about him, but he was the only interesting spark for KC at QB last year. He’s extremely mobile, and very unpredictable. He’ll run out of the pocket, run back 7 yards, then hurl the ball 50 yards for a touchdown. He was far from perfect, but there were signs last season that Thigpen could be a good quarterback. 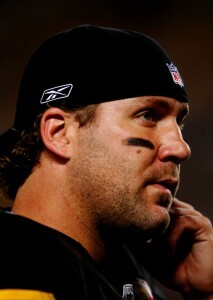 Perhaps with a change of scenery in Miami, Thigpen will finally get his chance. Elsewhere in sports, some good news from a very bad situation. Over the weekend, USC’s star running back, Stefon Johnson, suffered a horrifying injury. Not on the field, but in the weight room. While bench-pressing, Johnson’s hand slipped and the bar fell down on his throat. And this is no light amount of weight. These guys bench upwards of 300 / 400 pounds. That amount of weight would kill a normal person, but doctors said that because Johnson had such strong neck muscles, it allowed him to keep breathing until someone removed the weight, and was rushed to the hospital. Well, yesterday, Johnson came out of surgery and gave his mom a thumbs-up, indicating that he was okay. Obviously not recovered, but okay in the sense that he will live another day. Sadly, Johnson is currently being fed through a tube in his stomach, and required a tracheotomy to enable him to breathe, but this is the first sign indicating that he will survive the injury. He most likely will not play football again for USC, but that is the last of his worries at this moment. Here’s to a 100% recovery to Stefon Johnson. 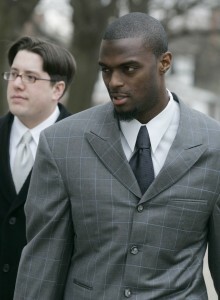 In the NFL, it was a sad day for former Giants receiver Plaxico Burress. Last year, Burress for carrying a concealed weapon… a gun that he wound up shooting himself with. It’s been a year of court appointments for the former Pro-Bowler, and quite a tumultuous process, but yesterday he received his sentence of two years. After learning of the sentence, Burress turned to his young son and daughter and told them to be strong. He then was escorted to the prison to serve his two-years. This is quite a complicated issue, and here’s why. Sure, Plaxico did have a weapon on him, and yes it did go off, but two years? Does it seem extreme to you? To put it in perspective, Cleveland Browns wide receiver Donte Stallworth killed a man while drunk driving, and he didn’t get anything close to the sentence Burress got. A little jail time, some community service, and a year suspension from the NFL. Rather light for actually killing someone. All Burress did was shoot himself by accident. In both instances, it appears that the punishment doesn’t fit the crime. So, now to a little humor out of the NFL. 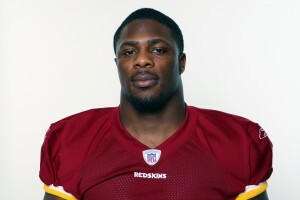 Washington Redskins linebacker Robert Henson had an active Twitter account in which to communicate with fans. However, after the Redskins looked awful against a putrid St. Louis Rams team, and were booed by the fans, Henson posted something quite interesting on Twitter. He wrote, that Redskins fans were dimwits, and wondered how people that “work 9 to 5 at McDonalds could know what’s best for the team”. Yikes. Well, he took the Twitter account down the next day. Needless to say, the media has had a field day with this story. And in baseball, the drought is over, as the New York Yankees finally clinched a playoff birth. Last year, the Yankees missed the playoffs for the first time in quite a while. That’s normal for most teams, but the Yankees have the highest payroll in baseball. Anything short of making it to the World Series is seen as an abject failure. And they really didn’t have to do anything for it. The Yanks actually got in because Texas lost to Oakland, putting Texas out of contention for the playoffs. Question is… how far will they go? The prime time match-ups in the NFL have been absolutely thrilling. Every night game so far has come down to the wire. Last night was no exception. It was the Indianapolis Colts visiting the Miami Dolphins on Monday Night Football. The Colts were a bit banged up, as they lost their #2 wide receiver Anthony Gonzalez in Week 1. He’s reportedly out for 8 weeks, so they needed some other offensive options. The Dolphins meanwhile had a poor Week 1 outing, and they were looking to rebound at home. The Dolphins strategy was simple: Keep Peyton Manning and the Colts offense OFF the field. If he’s not on the field, he can’t score. Well, it was working for a while. The Dolphins rushed the ball 43 times between their two running backs, Ronnie Brown and Ricky Williams. Brown had a fantastic game, finishing with 136 yards and 2 touchdowns. However, it just wouldn’t be enough to take down the Colts. Manning had the ball for only 15 minutes in the game, but boy did he make the most of it. In just that minimal amount of time he threw for 303 yards and 2 touchdowns. One of which was the game-winning TD to the young wide receiver Pierre Garcon. With this win, Peyton Manning becomes the most winning quarterback in Colts history, surpassing the legend, Johnny Unitas. Manning said he felt honored to even wear the same uniform as Johnny Unitas, and that he was proud to even be mentioned with him. But at what point do you start saying that Peyton is actually better than Unitas. Realistically, the competition that Peyton is facing is much more fierce and athletic than in Unitas’ day. 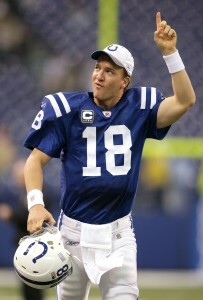 Congratulations to Peyton Manning. As for the Dolphins, they’ve got a big hill to climb if they expect to get back to the playoffs. Indianapolis 27, Miami 23. In the NBA, the Miami Heat’s Michael Beasley, the #2 pick in the NBA draft, checked out of rehab yesterday and rejoined the team. A few months ago, Beasley signed up for a rehab program for substance abuse. It wasn’t specific (or at least not public) which drug Beasley had the problem with, but he was fined $50,000 during the season for being in a hotel room that bore the scent of marijuana. However, Miami’s coaches said that Beasley looks great. “He looks bigger”, they said. Apparently he’s looking good in workouts, and the Heat want him to play a bigger role next season. This could actually turn out well. What a weekend it was in the football world. The highlight from college came out of Seattle, where the new-look Washington Huskies were looking to take down the giant that is USC. USC came into the game ranked #3 in the nation, and were hoping to move up. On the flip side, Washington wanted to show they are the Huskies of old. The game was anything but an offensive showdown, but Washington QB Jake Locker played brilliantly, keeping the UW offense on the field and not making any mistakes. 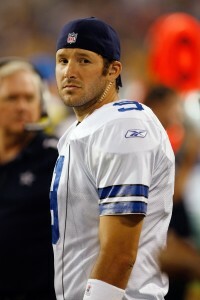 He finished the day with 237 passing yards and a rushing TD. And then, with 3 seconds left, Washington kicked a game winning field goal to upset the Trojans. Wow! Washington 16, USC 13. On to the NFL, where Drew Brees and the explosive New Orleans offense would be put to the test against a very stingy Eagles defense. 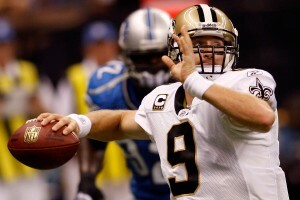 Last week, Brees threw for 6 touchdowns against the Lions, but it’s the Lions, right? That doesn’t mean anything, right? Surely, the Eagles would rain on their parade, right? But ladies and gentleman… it’s the offense. The Saints have so many weapons and options, they can do almost anything. Brees hurled three more touchdowns, and finished the day with 311 yards. Even their surprise running back, Mike Bell, looked terrific, rushing for 86 yards a TD. The Saints are going to be very difficult to beat this season. Look out! New Orleans 48, Philadelphia 22. Elsewhere in the NFL, it was a battle of two major franchises as the Steelers came into Chicago. The Steelers were hoping for a 2-0 start to a Super Bowl defending season, and Chicago desperately wanted to rebound from their disgusting loss to the Packers in Week 1. Well, the Steelers controlled most of the game, with Roethlisberger throwing for 221 yards and a TD, but Jay Cutler and Chicago would make a comeback. They tied the game with 6 minutes to go in the 4th, and then with just 15 seconds left, Chicago’s Robbie Gould kicked a 44-yard kick to win the game. Beating the defending Super Bowl champs is one way to ease the pain of an ugly debut loss. Chicago 17, Pittsburgh 14. Finally, the featured matchup of the day was definitely the New York Jets v. the New England Patriots. The Jets had been smack talking all week about how they were going to smother the Patriots. Of course, the Pats have heard this all before, and just dismissed the garbage talk. Well, in their home debut of the season, the Jets came out FIERCE. They barely let the Pats offense do anything. Brady threw for a mere 216 yards, and didn’t toss one touchdown. The game remained close, but the Pats just couldn’t get it done. An amazing upset by the Jets, who hadn’t beaten the Patriots in New York since 2000. Maybe the tides are changing in the AFC East. NY Jets 16, New England 9. In college football, a much anticipated match-up between Georgia Tech and Miami. Miami used to be a dominate team in the 90s and the early part of this decade, but they have been nothing more than average over the past 5 years. This season, however, they started the season 1-0 against ranked rival Florida State. So this game would determine if the Hurricanes were for real. The answer: Yes. And the man behind the show is quarterback Jacory Harris. He looked brilliant out there, finishing the game with 3 touchdowns and 270 yards. And NO interceptions on top of that. This gives the Hurricanes two straight wins over ranked opponents. Unfortunately for Miami, it doesn’t get any easier. Their next match-up is agasint #13 Virginia Tech, and then mighty Oklahoma is on the horizon after that. Miami 33, Georgia Tech 17. In the NFL, the New York Jets are talkin’ the talk saying they are going to, quote, “embarrass” the New England Patriots. Namely, it was free safety Kerry Rhodes doing the talking, saying that they were going to hit Brady more than six times. Remember, this is a new look Jets team that wants to punish opponents. Their leader, acquired during the off-season, is Rex Ryan (son of defensive mastermind Buddy Ryan). These guys want to destroy the Patriots and make a statement to the NFL that they are a force to be reckoned with. Finally, some news out of the NBA. It appears that Washington Wizards superstar Gilbert Arenas is angry with his team and wants out. Arenas is supposedly back to 100% health again after working with renowned trainer to the superstars, Tim Grover. Apparently, upon reporting to the facility, Grover said Arenas was in bad shape. However, the Wizards trainers said Arenas was ready to play. Arenas’ gripe is that the Wizards organization should have held him back longer, rather then letting him get on the court when he was still injured. That’s how you suffer career ending injuries, by not allowing your body the time it needs to repair. This is obviously not a good way for the Wizards to head into next season. In the NFL, a very interesting story has developed. After the Buffalo Bills lost to the New England Patriots in the closing minutes of the game, the city of Buffalo was outraged especially because the Bills essentially blew the game on a bad decision from Buffalo Bills cornerback Leodis McKelvin. With under a minute left, he caught the ball in the end zone, and instead of downing it so the offense could run out the clock, he decided to run it out. Well, after he crossed the 20 yard line, the Patriots forced him to fumble, got the ball back, and scored in the closing seconds of the 4th quarter to win the game. Buffalo fans were livid, and then… some scary stuff happened. McKelvin’s lawn was vandelized with profanity in the lawn. This obviouisly is a crime, but more notably, this is an era where two NFL players were killed in the last few years (Steve McNair and Sean Taylor). It’s not in good fun anymore, it’s serious business. 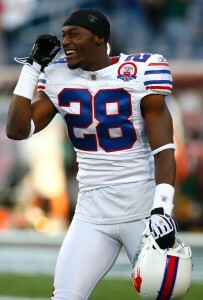 McKelvin, however, said he really didn’t mind, and chalked it up to the tenacity of Buffalo fans. He said fans here were great, and he was proud to see they cared so much about the team’s success. He even found the profanity in his yard amusing. At the same time, the Bills’ new wide-receiver, Terrell Owens, didn’t find this as amusing. He said it’s one thing if it’s kids, but if it’s adults, that’s some sad and scary stuff. With that said, it was reported yesterday that the vandelisim was the product of two 16-year old kids. McKelvin said he didn’t want to press charges. And perhaps his relaxed attitude is out of fear that something worse will happen if he become’s the city’s antagonist. In fact, he’s expecting a warm welcome when the Bills play their first home game on Sunday. Owens, on the other hand again, said he and the Bills will have the last laugh when they make the playoffs. And, all things considered, the Bills did look decent in that game. He may have a point. Some serious drama in the Bronx. It was practically a meaningless game between the Toronto Blue Jays and New York Yankees. 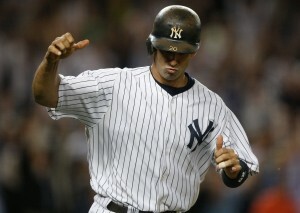 Early in the game, Yankees catcher Jorge Posada was hit by a pitch, and pondered charging the mound. The benches cleared just in case something major happened. It didn’t. But, later in the game, Jorge Posada crossed home plate and intentionally bumped into Toronto pitcher Jesse Carlson, and, um, that did it. The benches cleared and there was quite the brawl. Roy Halladay picked up another win for Toronto, but unfortunately, their season is long over. Toronto 10, NY Yankees 4. Elsewhere in baseball, the American League playoff picture is pretty much set. So everything right now is essentially just exhibition and preparation. With that said, the Boston Red Sox took on the Los Angeles Angels in a preview of their post-season battle. And guess who’s back from injury… Boston superstar pitcher Dice-K. He went 6 innings against the Angels and pitched marvelously, picking up the win and striking out 5. He will be an integral part of the Red Sox run to another World Series, to be sure. Boston 4, LA Angels 1. And in the NBA, Golden State Warriors star Stephen Jackson was fined $25,000. Not exactly small change to most people out there. Why? Because he publicly stated, in a magazine, that he wanted to be traded. And according to league rules, players are not permitted to publicly announce trade requests. That’s supposed to be between management and player. So Jackson must really want want to be traded if he’s willing to cut a $25,000 check to let the public know. In the NFL, the New England Patriots were on display with their old captain at the helm. That’s right, Tom Brady made his triumphant return to the Patriots after a season ending injury in Week 1 of last year. It was also the premiere game for Terrell Owens as a Buffalo Bill. Needless to say, a lot to watch. The Pats started off slow, and the Bills even took an early lead. But, in the 4th quarter, Brady did what he does best, and led the Pats to a major comeback. He hit tight end Ben Watson TWICE for Touchdowns, one in the last minute to clinch the game. Amazing! As for Owens, a slow night. Only 2 catches for under 50 yards total. That could wind up being some series T.O. drama for Buffalo. New England 25, Buffalo 24. Elsewhere in the NFL, the San Francisco 49ers are considering offering a new deal to their top draft pick, Michael Crabtree. 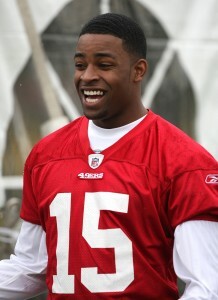 Crabtree has held out this entire time because he feels he deserves more money. Sure, doesn’t everyone feel that way. But Crabtree’s main complaint is that he should be paid as a higher draft pick would, not solely by his draft position. He has even threatened to leave the 49ers and re-enter the draft next year under the assumption that he would be picked higher, and thus receiver more money. We’ll see how this plays out. Coach Mike Singletary, however, has told management to keep him out of it. He needs to focus on his active 53-man roster, and remain undefeated. Finally, the Philadelphia Eagles may have looked great on Sunday, trouncing the Carolina Panthers. But, up by 21 points late in the game, they lost their starting quarterback Donovan McNabb to a rib injury. Well, McNabb should definitely be out for next week, but the Eagles don’t really have a solid backup. Sure, they grabbed Vick, and the fans want him BAD. But, realistically, Vick is still slowly making his comeback, and barely knows the Eagles offense. So the Eagles turned to Jeff Garcia, who led them to the NFC Championship game as a back-up a few years ago. Hey, why not give him another shot? He’s available, right. It’s a worthy experiment for at least a week or two. 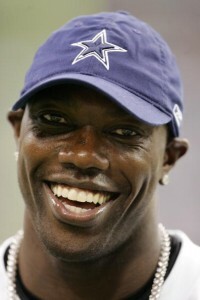 The Dallas Cowboys kicked off the season without Terrell Owens as their star receiver. Many wondered if their passing offense would be as potent without him. The answer: Yes. Tony Romo threw for a career high 353 yards and also chalked up 3 TDs to 3 different receivers (Roy Williams, Patrick Crayton, & Miles Austin). The Cowboys looked sharp, completely beating up the Tampa Bay Bucs. Now they head home for their premiere game in their deluxe new stadium. On the flip side, Tampa Bay’s Cadillac Williams had a comeback game, posting 97 yards and a touchdown. Dallas 34, Tampa Bay 21. Over in New Orleans, the Saints wanted to get a lightning bolt start, and show the league that they are a serious contender this year. Fortunately for them, they have (1) Drew Brees — a superstar QB, and (2) they were playing the pitiful Detroit Lions. 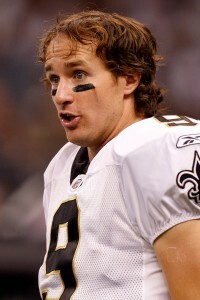 Well, lets just say, Drew Brees was ON FIRE. He threw for not 1, not 2, not 3, 4, 5, but 6 TOUCHDOWNS!!! He… could… not… be… stopped. Truly an unbelievable performance. He finished 358 yards, 6 TDs, and just 1 INT. Watch out for the Saints this year, they are extremely explosive!! As for the #1 pick of the draft, Matt Stafford, he finished with no touchdowns and 3 INTs. New Orleans 45, Detroit 27. In Cincy, the Bengals were looking for a fresh start. Their former all-star quarterback Carson Palmer was back, and ready to reignite their high-powered offesne. Meanwhile, the new look Denver Broncos were hoping to get it done with their new quarterback Kyle Orton (who came over in the bizarre trade for Jay Cutler). Well, there wasn’t much scoring, and just a few field goals were exchanged. Then, the Bengals took the lead with under 30 seconds on the clock. It seemed they would open the season with a win. But, on the next posession… a miracle. Denver’s Orton heaved it up, and a Bengal defender tipped the pass directly to… Denver’s Brandon Stokely, who took it all the way for a touchdown. Purely amazing! And the Broncos steal a mind-blowing win to start the season. Denver 12, Cincy 7. Finally, the NBC Sunday Night Game featured the age-old rivalry: Green Bay v. Chicago. It was supposed to be an offensive showdown, with the Packers Aaron Rodgers on an MVP campaign, and the new strong-armed quarterback of the Bears, Jay Cutler, looking to air it out. However, the game turned into a DEFENSIVE stand still, and Cutler looked putrid in the first half, throwing 3 interceptions. The Bears came back in the second, but the Packers would have one more chance. Then, hoping to get in field goal range to take the lead, the Packers found themselves in a 3rd and 1 with about 55 yards in front of them. On a whim, Aaron Rodgers faked a hand-off, then threw a long bomb to a WIDE OPEN Greg Jennings for a jaw-dropping TD. Amazing! 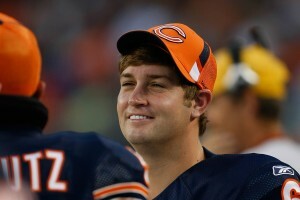 Cutler would get one more chance and a minute to take the Bears down the field. He’s supposed to be their savior, right? And journalists everywhere were prepared for either super positive or super negative headlines. But, on the very first play, Cutler threw a nasty interception that would end the game. He marched off the field with his head hung low. Now, the Bears have to take this ugly loss back to Chicago to take on the defending champion Pittsburgh Steelers. Green Bay 21, Chicago 15.
touchdown. And we headed into the second half tied at 7.
only works if they actually put pressure on the quarterback. send the game into overtime.